Many, if not most of the steps described here, are the same regardless of the engine choice. Injected engines will differ mostly with regards to electrical connections and fuel system plumbing. The main mechanical components and basic proceedures are generally the same. NOTE: Since we are not performing your conversion, it's up to the installer to insure that all applicable emissions and legal considerations are met. This usually means that the new engine must be of the same or newer year than the car, and has all the engine's systems complete and intact. The exception is usually the catalytic converter, and that system usually has to be consistant with the requirements of the chassis. The engine will also likely be required to be from the same class of vehicle (example: no engines from heavy duty trucks installed into passenger cars). Before proceeding, be sure to consult the appropriate local authority on the legality and conditions necessary for a successful and legal engine conversion in your area. ......Intake Selection...Use one of the lower profile intake set-ups such as that used on the T-Bird. ......Subframe Shimming...1/2" thick spacers can be installed between the RX-7 chassis and the stock RX-7 front subframe. The net effect is that the entire engine and steering rack are lowered in relation to the body, which increases hood clearance. The steering rack is lowered along with the lower control arm's inner pivot points. This is much preferred over simply lowering the steering rack and engine only, which would create a nasty bump-steer situation. Lowering the entire subframe minimizes any ill effects. 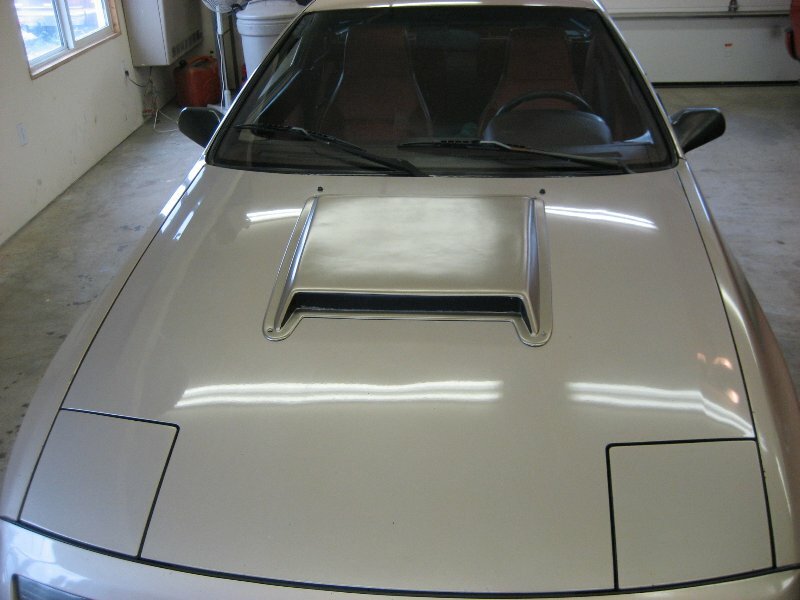 This modification has no effect whatsoever on ride height due to the RX-7's strut style front suspension geometry. ......Plenum Milling...This method is often used when stuffing the 5.0 into the Miata as well. The idea is to mill the mating surface of the plenum where it attaches to the lower intake manifold. The amount milled depends on the clearance between the plenum and the valve cover, so use the shortest valve covers you can to maximize the gain. Many mill to the point that the plenum actually contacts the valve cover, and then grind clearance into the bottom side of the plenum to eliminate the contact. Radiator to Accessory Drive Clearance...Older carbureted engines have the option of using a short water pump, but the injected engines can use the shorter accessory drive set-up that was used on the T-Bird or the '94-'95 Mustang. The Ford engine, on the other hand, is one of the most common engine on the planet. Most any person with automotive experience has worked on one, and a large factory trained network of technicians exist from coast to coast. The modern Ford engine routinely goes 100k between tune-ups, and replacement parts are among the cheapest and most common. ...As you might suspect, the switch to a V-8 powerplant has an effect on performance too. The additional low-end torque makes the RX-7 very easy to drive, and is available throughout the RPM range. No longer will you have to excessively slip the clutch at a stop light to keep from killing the engine. No longer do you have to downshift, wait for your RPMs to come up (or boost to build) to pass a car. No longer will you live in constant fear of the dreaded carbon lock. With the V-8, your power is always available. If and when it comes time for an upgrade, things can really get interesting. Simple $100. modifications can result in 15-20hp increases, while spending a mere $4-5000. can get you up to around 500hp level. We are seeing low to mid 13 second 1/4mi times from mild smog legal engines with around 300-325hp, which is better than the high 13 second times that were possible with the 3rd gen RX-7’s stock twin turbo rotary engine. The example car is an ‘86, which was not lightened in any way. The car was converted using a ZZ-4 crate engine & T-5 transmission. It has a full stock interior, as well as the stock air conditioning and power steering. 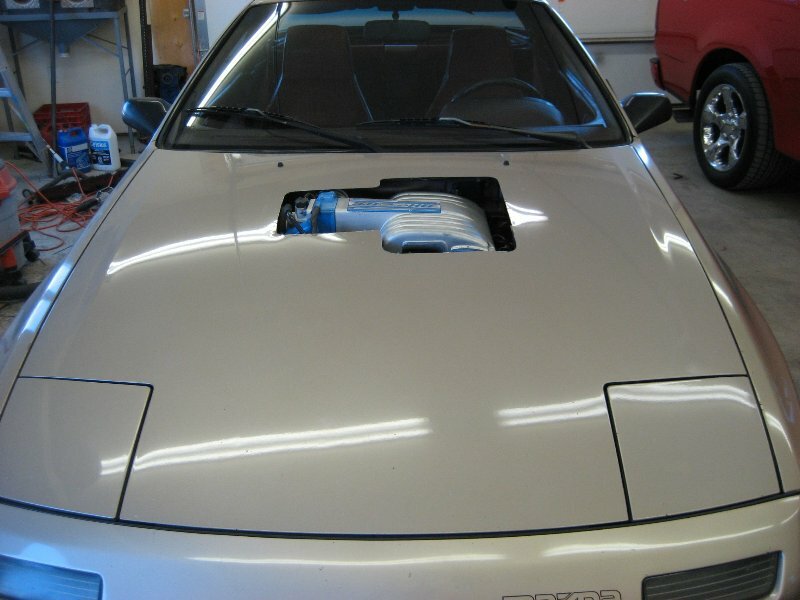 The stock RX-7 cooling system was re-located but retained, as was the stock RX-7’s engine oil cooler. The battery was relocated to rear area just in front of the tail lites. With a full tank of fuel, the balance is close to 50/50, 1535 lbs front / 1545 lbs rear, for a total of 3080 lbs (including the 200lb driver). Subtract the weight of the 200lb driver, and the total weight is 2880, 235lbs heavier than the RX-7's 2645 stock weight, and amazingly slightly less than the later Turbo II's stock weight of 3003lbs.